Interaction between the Haptoglobin 2 phenotype and Diabetes Mellitus on systolic pulmonary arterial pressure and nitrix oxide bioavailability in hemodialysis patients. 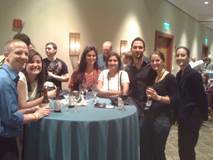 Inbal Dahan, Evgeny Farber, Nadia Thauho, Nakhoul Nakhoul, Adi Francis, Mohamad Awawde, Andrew P Levy, Daniel Kim-Shapiro, Swati Basu, Farid Nakhoul. Journal of Diabetes Research, Vol 2015, p 1-7, 2015. The relationship between plasma and salivary NOx. �William H. Clodfelter, Swati Basu, Crystal Bolden, Patricia C. Dos Santos, S. Bruce King, Daniel B. Kim-Shapiro.� Nitric Oxide, Vol.47, p 85-90.� 2015. Acute dietary nitrate supplementation does not augment submaximal forearm exercise hyperemia in healthy young men.� Jin-Kwang Kim, David J Moore, David G Maurer, Daniel B Kim-Shapiro, Swati Basu, Michael P Flanagan, Ann Skulas-Ray, Penny Kris-Etherton, David N Proctor. Applied Physiology, Nutrition, and Metabolism, 40, 122-8, 2015. Dietary Nitrate Supplementation Improves Exercise Performance and Decreases Blood Pressure in COPD Patients (2014). Michael J Berry, Nicholas� W Justus, Jordan I Hauser, Ashlee H Case, Christine C Helms, Swati Basu, Zachary Rogers, Marc T Lewis, Gary D Miller. Nitric Oxide: Biology and Chemistry. 2014. Low NO concentration-dependence of the reductive nitrosylation reaction of hemoglobin (( 2012). Journal of Biological Chemistry, Vol 287(22), 18262-18274. � Jesus Tejero, Swati Basu, Christine Carlisle, Neil Hogg, S. Bruce King, Daniel B. Kim-Shapiro and Mark T. Gladwin. Cytochrome c-mediated formation of S-nitrosothiols in cells (2012). Biochemical Journal, Vol. 442(1), 191-197. Katarzyna A. Broniowska, Agnes Keszler, Swati Basu, Daniel B. Kim-Shapiro and Neil Hogg. Human neuroglobin functions as a redox regulated nitrite reductase. (2011). Journal of Biological Chemistry, Vol. 286, 18277-18299. 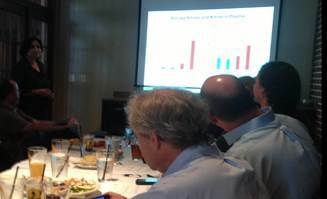 Mauro Tiso, Jesus Tejero, Swati Basu, Ivan Azarov, Xunde Wang, Virgil Simplaceanu, Shiela Frizzell, Thottala Jayaraman, Lisa Geary, Calli Shapiro, Chien Ho, Shruti Shiva, Daniel B. Kim-Shapiro and Mark T. Gladwin. A novel role for cytochrome c: Efficient catalysis of S-nitrosothiol formation. (2010). Free Radical Biology and Medicine, Vol. 48, 255-263. Swati Basu, Agnes Keszler, Natalia A. Azarova, Nneka Nwanze, Andreas perlegas, Shruti Shiva, Katarzyna A. Broniowska, Neil Hogg and Daniel B. Kim-Shapiro. An electron paramagnetic resonance study of the affinity of nitrite for methemoglobin. (2010). Nitric Oxide, Vol. 22, 149-154. Bradley I. Goetz, Howard W. Shields, Swati Basu, Pamela Wang, S. Bruce King, Neil Hogg, Mark T. Gladwin and Daniel B. Kim-Shapiro. Rate of nitric oxide scavenging by hemoglobin bound to haptoglobin. (2008). Nitric Oxide, Vol 18, 296-302. Ivan Azarov, Xiaojun He, Anne Jeffers, Swati Basu, Burak Ucer, Roy R. Hantgan, Andrew Levy and Daniel B. Kim-Shapiro. Nitrite Reductase Activity of Cytochrome c. (2008). Journal of Biological Chemistry, Vol. 283(47), 32590-32597. 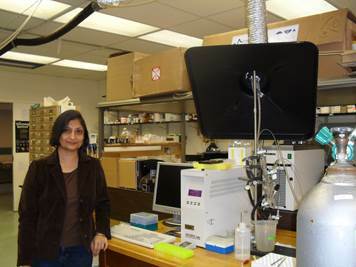 Swati Basu, Natalia A. Azarova, Michael D. Font, S. B. King, Neil Hogg, Sruti Shiva, Mark T. Gladwin, Daniel B. Kim-Shapiro. Chemiluminescent Detection of S-nitrosated Proteins: Comparison of the Tri-iodide, 3C and the modified 2C methods. (2008). Methods in Enzymology, Vol. 440(F). 137-153. Swati Basu, Xunde Wang, Mark T. Gladwin, Daniel B. Kim-Shapiro. Rate of Nitric Oxide scavenging by hemoglobin bound to haptoglobin. (2008). Nitric oxide: Biology and Chemistry. Vol. 18, 296-302. 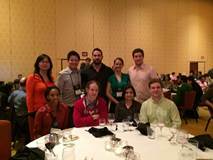 Ivan Azarov, Xiaojun He, Anne Jeffers, Swati Basu, Burak Ucer, Roy R Hantgan, Andrew   Levy and Daniel B. Kim-Shapiro. Nitrite reductase activity of hemoglobin S (Sickle) provides insight into contributions of heme redox potential versus ligand affinity. (2008). Journal of Biological Chemistry. � Vol 283 (6). 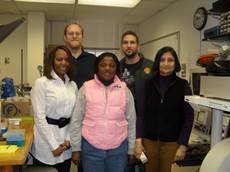 3628-3638.� �   Rozalina Grubina, Swati Basu, Mauro Tiso, Daniel B. Kim-Shapiro and Mark T. Gladwin. Catalytic generation of N2O3 by the concerted nitrite reductase and anhydrase activity of hemoglobin. (2007). Nature Chemical Biology, Vol. 3(12). 785-794. 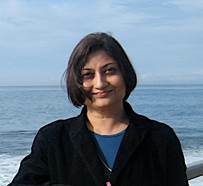 Swati Basu, Rozalina Grubina, Jinming Huang, Jeanet Conradie, Zhi Huang, Anne Jeffers, Alice Jiang, Xiaojun He, Ivan Azarov, Ryan Seibert, Atul Mehta, Rakesh Patel, S. Bruce King, Neil Hogg, Abhik Ghosh, Mark T. Gladwin, Daniel B. Kim-Shapiro. Concerted Nitric Oxide formation and Release from the Simultaneous Reaction of Nitrite with Deoxy- and Oxyhemoglobin. (2007). Journal of Biological Chemistry. Vol. 282(17). 12916-12927. 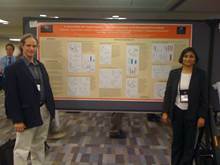 Rozalina Grubina, Zhi Huang, Sruti Shiva, Mahesh S. Joshi, Ivan Azarov, Swati Basu, Lorna A. Ringwood, Alice Jiang, Neil Hogg, Daniel B. Kim-Shapiro and Mark T. Gladwin. Hemoglobin effects in the Saville Assay. (2006). Nitric Oxide: Biology and ��� Chemistry. � Vol.15, 1-4, 2006. � Swati Basu, Jared D. Hill, Howard Shields and Daniel B. Kim-Shapiro. Lack of allosterically controlled intramolecular transfer of nitric oxide in hemoglobin. (2006). Blood, Vol. 107 (7), 2602-2604. Kris T. Huang, Ivan Azarov, Swati Basu, Jinming Huang, Daniel B. Kim-Shapiro. Nitric oxide scavenging by red blood cells as a function of hematocrit and oxygenation. (2005). Journal of Biological Chemistry, Vol. 280 (47), 39024-39032. 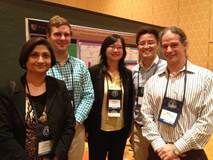 Ivan Azarov, Kris T. Huang, Swati Basu, Mark T. Gladwin, Neil Hogg, and Daniel B. Kim-Shapiro. Interactions between auxin transport and the actin cytoskeleton in developmental polarity of Fucus distichus embryos in response to light and gravity. (2004). Plant Physiology Vol.135, 1-13. H. Sun, S. Basu, S. Brady, R.L. Luciano and G. K. Muday. Early embryo development in Fucus distichus is auxin sensitive, (2002). Plant Physiology Vol. 130. 292-302 S. Basu, H. Sun, L. Brian, R. L. Quatrano and G. K. Muday. Chemical modification of essential arginine residues associated with the red beet (Beta vulgaris L.) plasma membrane Ca2+-ATPase, (1995). Phytochemistry Vol. 41, No. 3, pp. 685-689. S. Basu and D. P. Briskin. Target Molecular size suggesting a dimeric structure for the red beet plasma membrane Ca2+-ATPase (I995). Phytochemistry Vol. 38, No.1, pp. 15-17. � S. Basu and D. P. Briskin. Characterization of red beet plasma membrane H+-ATPase reconstituted in a planar paper bilayer system (1995). Plant Physiology 108-.393-398. D. P. Briskin, S. Basu and S. M. Assmann. Studies on the reaction mechanism and transport function of P-type ATPases associated with the plant plasma membrane. In: D. T. Cooke and D. T. Clarkson, eds. Transport and Receptor Proteins of Plant membranes. Molecular Structure and Function (1992). pp. 13-24 Plenum Press, New York. D. P. Briskin, S. Basu and I. Ho. Salinity induced changes in leaf expansion, photosynthesis and K+ accumulation in sunflower. In Current Research in Photosynthesis, M. Baltscheffsky, ed., Kluwer Academic Publishers, The Netherlands, (1989). Vol. IV, pp. 745-748. J. M. Cheeseman and S. Basu. The adjustment of growth and K+ transport in Helianthus annus during salinization (1989). Plant membrane transport. J. Dainty et al. Editors.663-666. J. M. Cheeseman. All studies by S. Basu. The Relationship Between Plasma and Salivary NOx (2014).� William Clodfelter, Swati Basu, Crystal Bolden, Patricia DosSantos, Bruce King, Dany Kim-Shapiro. 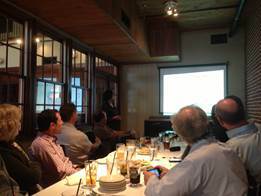 The Society for Free Radical Biology and Medicine�s Annual Meeting in Seattle, WA in November 2014. Hemoglobin is the Primary Erythrocytic Nitrite Reductase (2014). Chen Liu, Xiaohua Liu, Nadeem Wajih, John Janes, Swati Basu, Madison Marvel, Christine Helms, Debra Diz, Paul Laurienti, David Caudell, Jun Wang,� Mark T. Gladwin, and Daniel B. Kim-Shapiro.� International Nitric Oxide Conference & 6th International Nitrite/Nitrate Conference. Cleveland, Ohio June 16-20, 2014. Effects of iodide on nitrite reduction by ascorbate and implications on nitrosamine formation (2013). Swati Basu, Ryan Vest, S. Bruce King and Daniel B. Kim-Shapiro. Abstracts, Nitric Oxide, Biology and Chemistry, (31), 2013. Fifth International Meeting on the Role of Nitrite and Nitrate in Physiology, Pathophysiology and Therapeutics, Pittsburgh, PA.
Nitrite reduction by ascorbate is enhanced by iodide potentially mitigating nitrosamine formation (2012). Swati Basu, Ryan Vest, S. Bruce. King and Daniel B. Kim-Shapiro. Free Radical Biology and Medicine, Program and Abstracts, Vol 53 (2), 2012. 19th Annual Meeting of the Society of Free Radical Biology and Medicine, San Diego, CA, and at the Carolina Biological Symposium, Friday Center, Raleigh, NC, Nov, 2012. 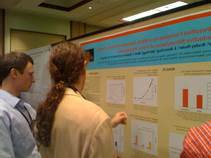 Nitrite Reductase Activity of Cytochrome c. Poster presentation at the 15th Annual Meeting of the Society of Free Radical Biology and Medicine, at Indianapolis, Nov, 2008. Swati Basu, Natalia A. Azarova, Michael D. Font, S. B. King, Neil Hogg, Sruti Shiva, Mark T. Gladwin, Daniel B. Kim-Shapiro. Formation of Nitroso Compounds in the Reaction of Nitrite and Hemoglobin. Swati Basu, Rozalina Grubina, Jinming Huang, Zhi Huang, Anne Jeffers, Alice Jiang, Xiaojun He, Ivan Azarov, Ryan Seibert, Atul Mehta, Rakesh Patel, Neil Hogg, S. Bruce King, Mark T. Gladwin, Daniel B. Kim-Shapiro. (2006). 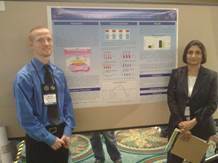 Poster presentation at the annual conference of the American Association of Hematology, Orlando. ApoB-antiHER2 single chain antibody fusion protein selectively targets lipophilic substance to HER2 overexpressing breast carcinoma cells. (2004). S. Basu, T. Kute, M. Willingham, L. Hou and G. S. Shelness. 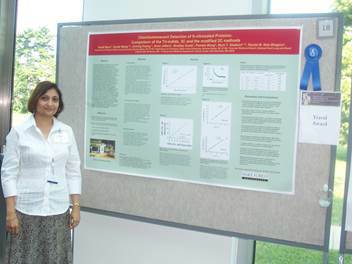 Poster presentation at the January 15, 2004 Breast Cancer for Excellence Retreat. Comprehensive Cancer Center of Wake Forest University. Effect of auxin transport inhibitors on polarization of Fucus embryos in response to light and gravity. 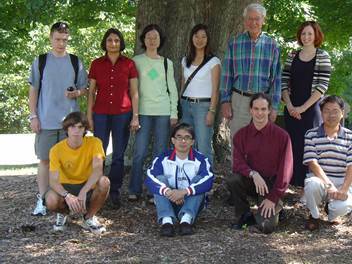 Chalk talk presentation in Plant Molecular Biology retreat, Ashville, NC, 2000. S. Basu and G. K. Muday. Chemical modification of the red beet plasma membrane Ca2+-ATPase by phenylglyoxal, 2, 3, butanedione and diethylpyrocarbonate (1993). Supple. Plant Physiology 102:127. S. Basu and D. P. Briskin. Characterization of the Ca2+-transporting ATPase of the plant plasma membrane using isolated membrane vesicles. In: R. T. Leonard, P. K. Hepler, eds. Calcium in Plant Growth and Development, American Society of Plant Physiologist, Rockville (1990). pp.46-54. D. P. Briskin, L. H. Gildensoph and S. Basu. Salinity responses in growth and carbon metabolism in sunflower (1989).� Supple.� Plant Physiology 89:118.� S. Basu and J. M. Cheeseman.